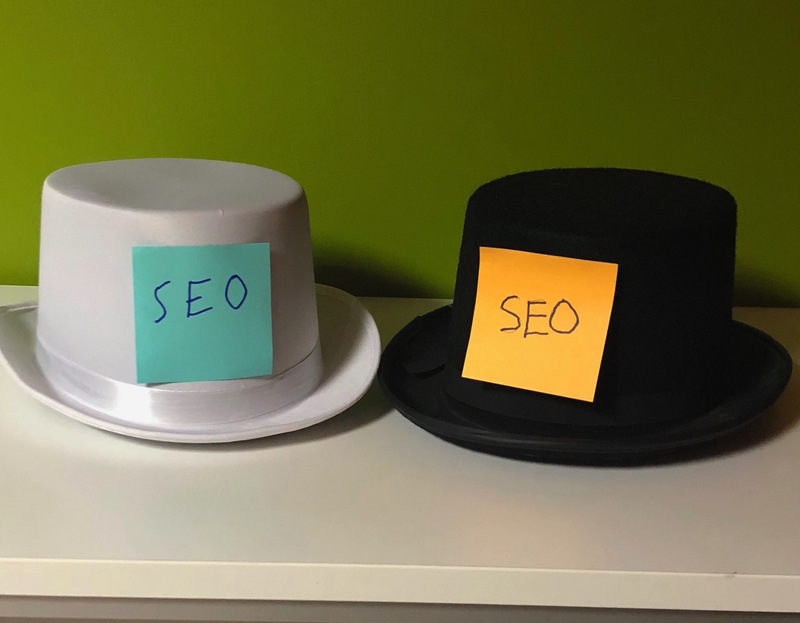 White Hat vs Black Hat SEO: Which Will You Wear? 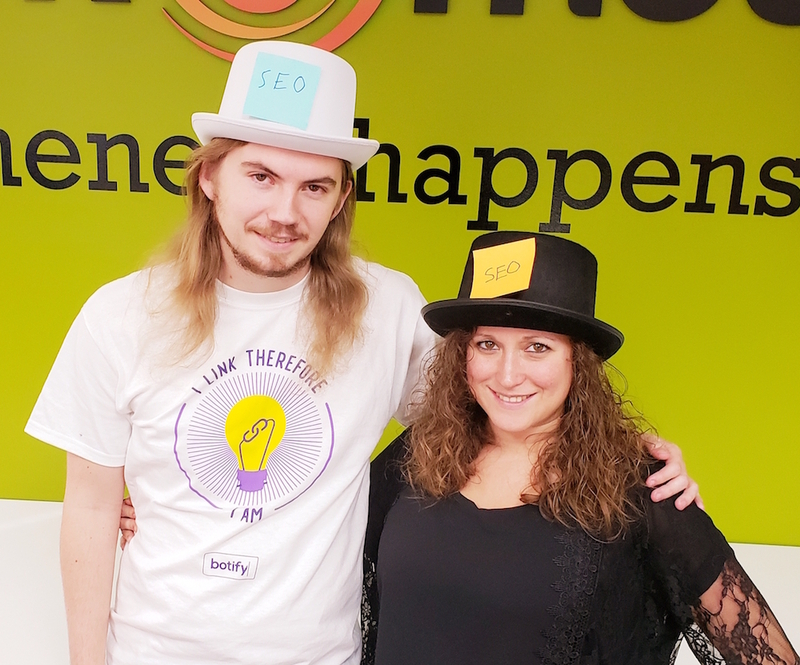 Other than that they make for great Halloween costumes (see pictures below) what’s the difference between these two SEO methods? Simply put, one is acceptable, and the other isn’t. Judging by the colors’ names, you can probably guess which is which. However, there’s much more to it than that! Let’s take a look at some major differences when it comes to white hat vs black hat SEO. The difference between white hat vs black hat SEO lies in the techniques used when trying to improve a website’s search engine rankings. 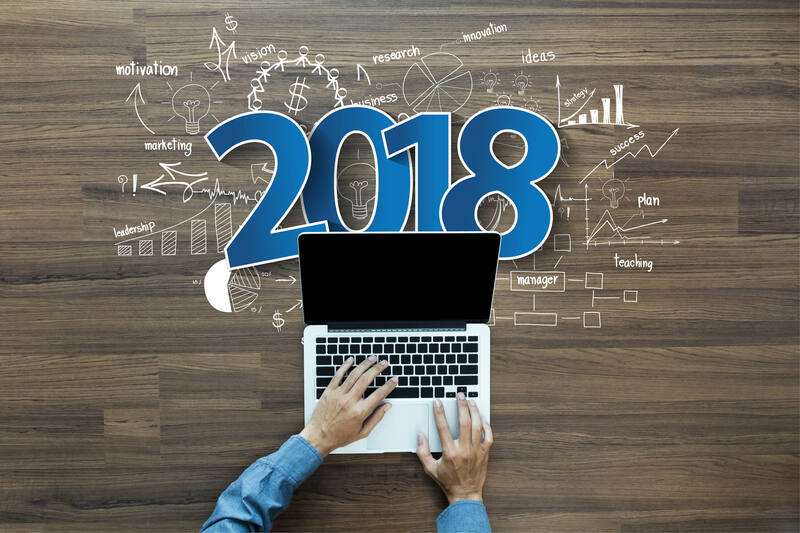 SEO techniques can broadly be classified into two categories: techniques that search engines approve of, and techniques that search engines do not. 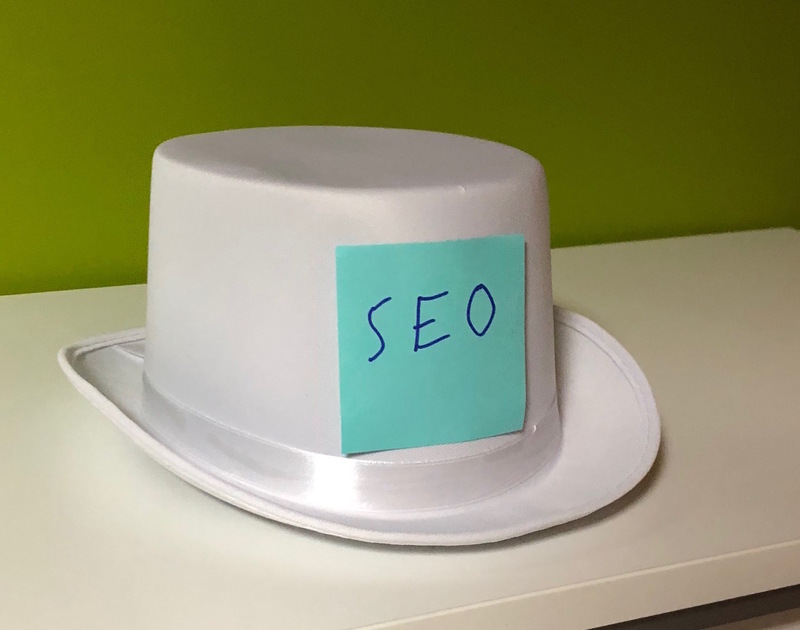 To start, let’s look at the first of these two: white hat SEO. Creating quality content is arguably the most important white hat SEO method, and “quality” is the key word here. Creating valuable content is important for SEO purposes because it shows search engines that your site is worthwhile. Additionally, quality content is far more likely to be shared and linked to. This type of content is easy to read, relevant to your niche, grammatically correct, and keyword rich. In order to create quality content, it’s extremely beneficial to research keywords that are relevant to your site. By using keyword research tools, you can weed out the most effective words and phrases that people may use to find your site. Be cautious, though, as using too many keywords could lead to keyword stuffing, which we’ll talk about later. Good backlinks are important because they’re essentially a vote of confidence for your site. They tell Google that you have quality content and that other websites vouch for your site. However, when it comes to backlinks, quality always comes before quantity. It’s not about how many backlinks your site has, but how many relevant backlinks it has. Using keywords properly in your content is very helpful, but keyword stuffing is a big no-no. It occurs when a webpage is jam-packed with keywords in the meta tags or content. Similarly, another black hat SEO technique is using unrelated, well-performing keywords to bait search engines. This looks extremely unnatural, which is a big red flag for search engines. We know that using certain words can benefit search rankings. So, some sneaky webmasters have tried to get around this by making the text color of certain words match the background of the site or setting the font size to zero. However, Google quickly caught on to this trick. Cloaking involves presenting users and the search engine spiders with completely different content. This is done by delivering content based on IP addresses. Like most black hat SEO tactics, cloaking may have worked in the past, but it doesn’t anymore. A link farm is a group of websites that all link to one another. The idea here was that it was better to have link quantity over link quality, but Google quickly realized that people using link farms were trying to cheat because of how unnatural it looked. Similarly, purchasing links is another black hat SEO strategy. As its name suggests, it’s the practice of buying links for the sole purpose of having a higher number of links. Surprisingly, people still try to do this, but most paid links are bad quality and will hurt your search rankings. 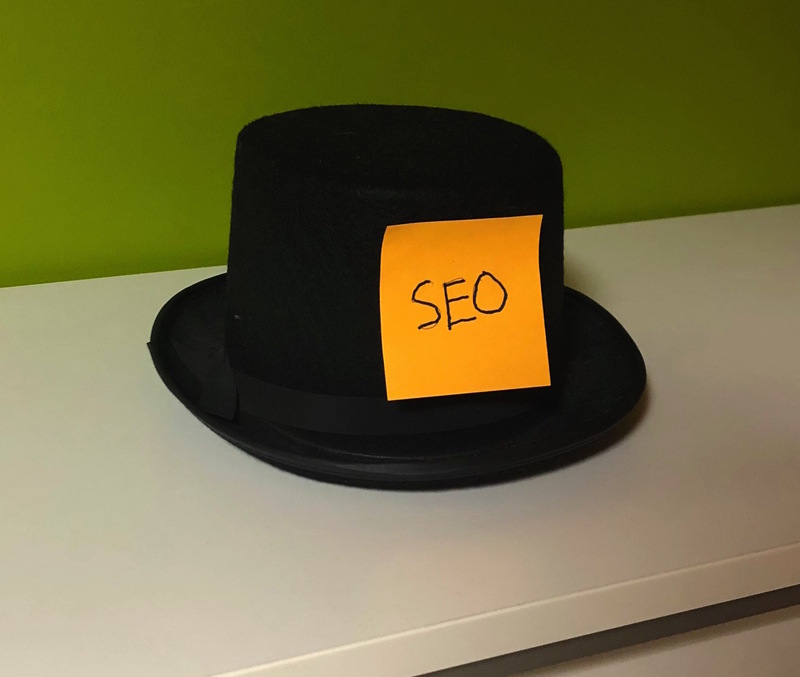 What do you think about white hat vs black hat SEO? Share your thoughts in the comments section below! Think your SEO strategy is up to par? Come work with us and show us what you’ve got! Do you have a business idea? Do you ever wonder what an experienced business owner such as Track5Media President Oliver Feakins would have to say about it? Well, here’s your chance to find out! Those of you with money-making ideas in Central Pennsylvania have the chance to pitch, collaborate, and learn from some of the best business owners in the area at Startup Weekend Central PA. On October 26-28, Track5Media President Oliver Feakins will be participating as a featured judge at the event, along with several other entrepreneurs, mentors, and coaches. The three-day event will take place at The Candy Factory, a co-working space in the heart of Downtown Lancaster. Lancaster, which is notorious for supporting startups and small, family-owned business owners, is the perfect backdrop for such an event. Here are three things you should know about Startup Weekend Central PA! The event itself is a 54-hour startup crash course on starting your own business. It’s a chance for designers, developers, and entrepreneurs to get together for a “three-day frenzy of business model creation, coding, designing, and market validation,” according to the event’s website. The website also promises all the internet and coffee you can consume, so be sure to test that theory. Oh, and they’ll also feed you. Anyone with a business or product idea is encouraged to attend, and no experience is necessary. Over the course of the weekend, participants work in teams to pitch ideas, collaborate, learn, and eventually create a prototype of their business model by the event’s end. The event culminates Sunday afternoon when teams present their ideas to a panel of judges, who will decide on the winning team. What can you learn from Oliver? Industry experts will act as speakers, judges, and mentors for the event. Luckily, with the event in downtown Lancaster, you get to hang out with some of the most successful business owners in the area. For the weekend, you can call our president Judge Oliver. Why should you care what he has to say? 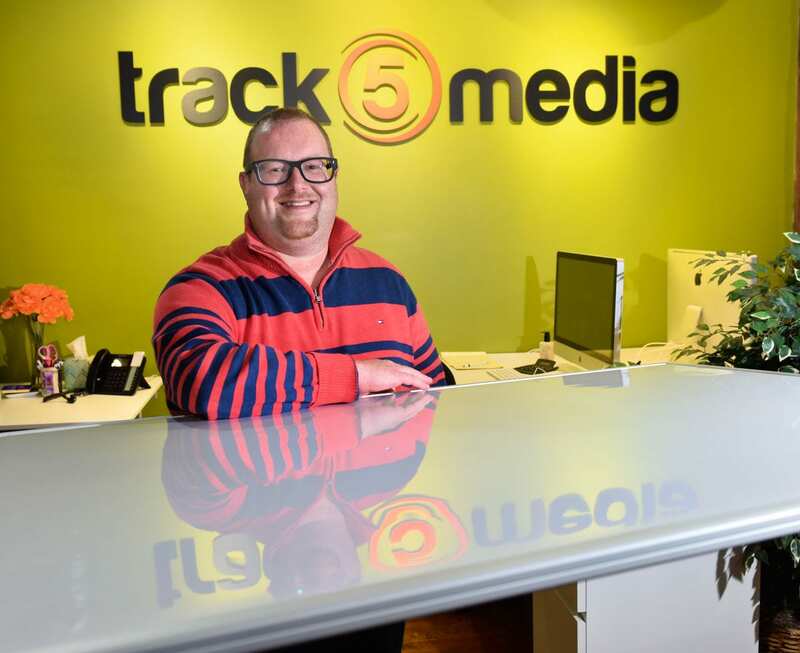 Well, for starters, he is the founder and president of Track5Media, a successful tech company in Lancaster that builds job board websites for niche industries. But that’s not all… He’s actually launched several start-ups over the years, won some awards, teaches Entrepreneurship at Millersville University and even runs his very own foundation, The Feakins Foundation, which is a non-profit which helps dreamers pursue their goals of a post-secondary education through college scholarships and guidance. So yeah, he’s a pretty cool guy and he knows stuff. Are you still with me? If you have a business idea, you can spend all weekend tweaking it to reality with really smart, successful people like Oliver. Ok, good. So, how do you sign up? To participate, you have to buy tickets. However, you can use this special promo code – OLIVER10 – for a discount. Organizers say that plenty of space is still available, so don’t miss this unique opportunity! Startup Weekend is an even that happens all over the country. There are three Startup Weekend events in happening in Pennsylvania this fall – Lancaster, Philadelphia, and Pittsburgh. Next weekend is the first time an event was held in Lancaster since 2015. I know some of you may be thinking, “what do truck drivers and Track5Media have in common?” Well, considering that one of our websites is a trucking job board, the two go hand in hand! I’ll admit, before I started working at Track5Media, I hated having to share the road with big rigs. I thought they were inconsiderate drivers who thought they were better than everyone else on the road. However, after working with AllTruckJobs.com and its podcast Big Rig Banter, I have a lot more respect for truck drivers. From writing trucking blogs to listening to interviews we’ve done with truckers, I’ve gained all sorts of exposure to the trucking industry. Working at Track5 definitely disproves the misconceptions and stereotypes you hear about truck drivers! Not only does Track5Media operate a trucking job board, but we also run several job boards for traveling healthcare providers, like travel nurses and doctors. Needless to say, working on these websites gives some of us serious wanderlust. Considering the fact that the furthest west I’ve been is Pittsburgh, I’m really itching to travel the country after seeing all the attractions that different states have to offer. I’m half kidding about this one, but it’s hard to resist the temptation to snack all day when our break room is full of yummy treats. 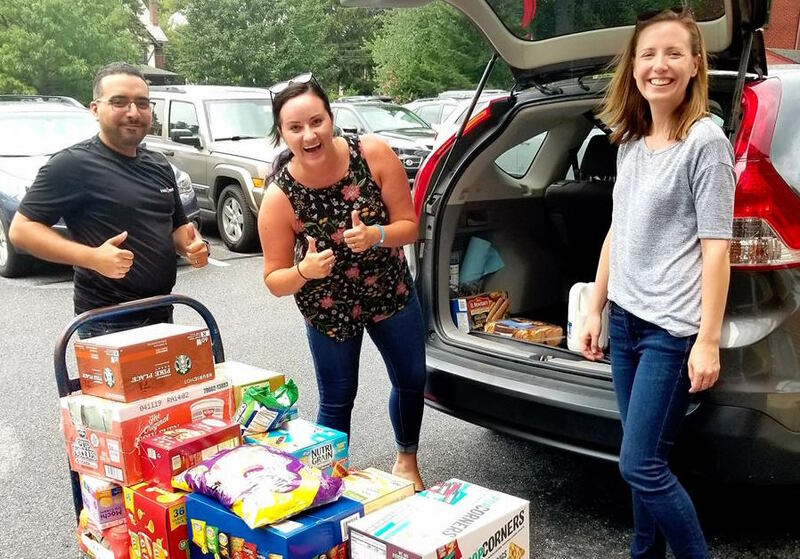 Every month or two, Aarin, our executive administrator, goes on a Costco trip and picks up all sorts of snacks for the office: Jimmy Dean breakfast sandwiches, chips, yogurt, popcorn…the list goes on. I’ll admit, I’m tempted to grab a snack every time I walk through the break room to use the bathroom. I’m sure you’ve heard of LaCroix: that fancy, flavored sparkling water that’s all the rage right now. The fridge is usually stocked with it after our Costco run, but we go through a case of it in the blink of an eye. Personally, I’m convinced that there’s some sort of additive in LaCroix that makes it addicting. When I first tried it, I took one sip, nearly gagged, and dumped the rest of it down the drain. Then, I started craving it and began drinking at least one can a day, and I have friends that have had similar experiences. Weird, right? A lot of the employees at Track5 are readers, and we’re always chatting about our latest reads. Thanks to coworkers, I’ve read books that I never would have chosen to read otherwise, and I loved them! Even better, we recently started a Track5Media Library! We built a few bookshelves, and everyone contributed some of their favorite books for others to read. It’s a “take a book, leave a book” type of thing! The awesome people are one of the best things about working at Track5Media. 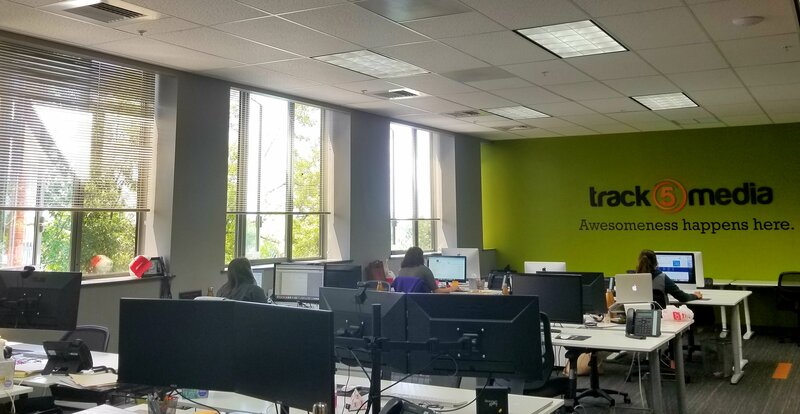 Everyone is very close-knit, but we have no problem making new employees or visitors feel right at home. Also, we have plenty of chances to get to know each other and hang out outside of the office through fun company events and outings. 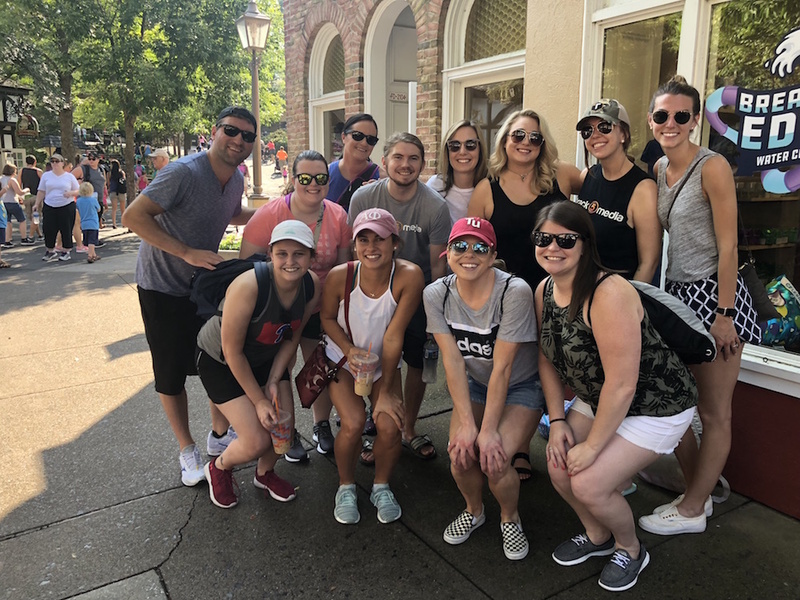 This year, we’ve gone to happy hours, Hersheypark, The Works in Wyomissing, and more! We also have occasional in-office lunches and parties where we all take a break from working, sit around a big table, eat food, and chat. There you have it! While there are some unexpected benefits of working at Track5Media, I’m sure most of us wouldn’t have it any other way! Interested in joining the team? We’re hiring! Check out our open positions.